If you've ever had a sleepover, you know how rare it is to see all the little divas tucked in! Still, this cake is utter perfection. 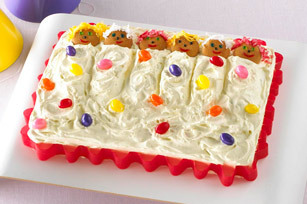 You'll know it's a special occasion when you get to enjoy a serving of this fun cake! Mix 1/4 tsp. water with a drop of food coloring. Add to coconut in resealable plastic bag; seal bag. Shake until coconut is evenly tinted. For easy removal of cake from pan, line the pan with foil before filling pan with batter.